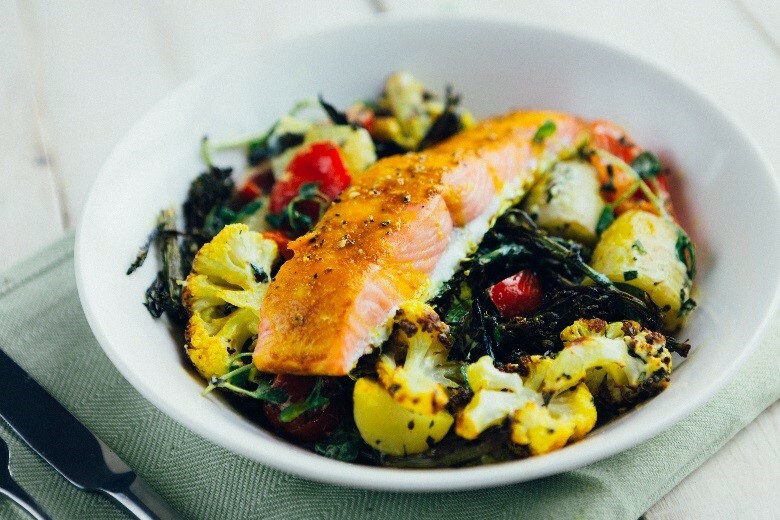 Bursting with vitamins and minerals as well as flavour, this healthy rainbow-coloured salmon salad bowl packs a substantial punch. Place the broccoli and cauliflower onto a roasting tray, drizzle with 1 tbsp turmeric oil and roast for 20-25 minutes until tender. Wash the potatoes and simmer gently in salted water for 10-15 minutes, until they are tender and cooked through. Remove from heat, drain and cut into bite-sized chunks. Meanwhile, place the salmon fillets onto a roasting tray, spread with the remaining turmeric mix, season and roast for 15 minutes until cooked through. Mix all the dressing ingredients together in a large bowl. Once the potatoes, broccoli and cauliflower have cooled, place them into the bowl with the dressing along with the watercress.